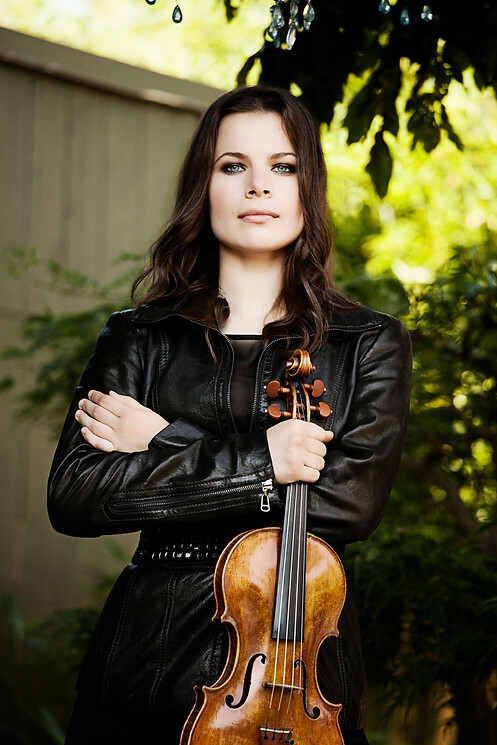 Editor’s note: Guest violinist Bella Hristova performs David Ludwig’s Violin Concerto (written expressly for her) with the Kansas City Symphony for the April 8-10 concerts in Helzberg Hall at the Kauffman Center for the Performing Arts. On the same program hear Ives’ Symphony No. 3, “The Camp Meeting,” Debussy’s Ibéria and Gershwin’s An American in Paris. Tickets start at $25. Select your seat online here or call the Symphony Box Office at (816) 471-0400. 1. Tell us about yourselves. How did you become professional musicians? Bella: I was born in Bulgaria and started playing the violin when I was 6. I started with the violin because my mother wanted me to. My father was a composer and my mom played piano and was a choral conductor. I was very drawn to the piano as a young child, but it was her dream for me to play violin. Now of course, it’s become my dream and I love playing the violin — but I also love listening to piano music. David: I grew up in a very musical family, but kept my own life as a musician pretty private until after I began on my own career path. I started getting commissions and making a life as a professional composer in my mid-twenties. When I was 6, I wanted to be a steam roller, but quickly realized that wasn’t possible. So after that, I tried lessons on as many instruments as I could, settling on a few … but all along I was interested in writing — second to composing was playwriting. I’ve come to think that being a composer is like the merging of being a playwright and musician. 2. How did this commission come about, and what is the intent for the piece? David: This commission is the result of a long conversation between Bella and me, Jaime Laredo, and Alan Jordan. Alan had the idea for the concerto with the Vermont Symphony (Alan is executive director with the Delaware Symphony now). Jaime is the music director of the VSO and they became the lead commissioner. Jaime has been an incredible mentor and friend to both Bella and me, and the thought was that the violin concerto would celebrate our marriage in some way. The commission became a consortium of eight orchestras total with additional support from New Music USA. With a consortium, everybody wins — the composer and soloist get to have the piece played multiple times, and orchestras each get to premiere a new work regionally for a more feasible buy-in than if they were the sole commissioner. We love this because it means we can share this piece with audiences and have it played by terrific groups like the Kansas City Symphony. 3. Can you describe the movements? (From the program notes) The piece is about the ritual of marriage, and it imagines the before, during, and after a traditional wedding ceremony. The first movement “Dances” begins with a loud crash–a jarring but transformative start to something new that transitions into a waltz-like music soon after. All told there are four dances in the first movement, connected by a cadenza and concluded by a Rachenitsa in its traditional irregular meter. The second movement “Ceremony” follows the progression of the wedding ritual. A slow unraveling processional is woven throughout the fabric of this movement, ending in musical rings created by the rise and fall of the violin against solo instruments in the orchestra. The third movement “The Festival” is my version of a Krivo Horo or “Crooked Dance” that captures the way people attempt to walk home after a great party. The music is celebratory to the end, reflecting the coming together of a community inspired by two people promised to preserve each other’s wellbeing for the rest of their lives. 4. For Bella, what do you love most about this concerto? Bella: It’s difficult to pick a favorite part of something this meaningful — and David has hidden little gems throughout the piece, such as our initials at the end of the second movement. Perhaps the most personal quote and one of my favorite things about it is that he quotes about 10 measures from my father’s violin concerto in the Ceremony movement. My dad passed away when I was very young and I never got to know him — and this way David found a way that my dad could be in some way involved in our wedding! 5. For David, what do you love most about your work? David: That my beautiful and extraordinarily talented wife is premiering it! I have been thinking about this piece since we started together nearly six years ago. 6. Will this be your first time in Kansas City, and first time performing with the Kansas City Symphony? Bella: Yes, it’s my first time in Kansas City and first time performing with the Symphony. I have many friends in the orchestra and have known Maestro Stern for quite a few years now, so I’m thrilled for us to come together for a very exciting week of music making! David: Also my first time on both counts. And ditto/agreed on the rest. We have many good friends in that orchestra, and we’ve both known and admired Michael Stern for a long time. Also, I’m going to need to try the barbecue as soon as possible. 7. When you’re not making music, what other activities or pastimes do you enjoy? Bella: I love spending time with our two cats, Uni and Schmoopy, watching TV, playing video games and solving jigsaw puzzles. David: I guess I don’t have a lot of hobbies, but I love teaching and working with people and communities while on residencies. I spend a fair amount of time reading articles about music, science, and movies online — and probably too much time on Twitter and Facebook. 8. What do you hope audiences take away from the performances? David: For me, I want the concerto to share its message of partnership, empathy, and communion. But even before the message is the experience — I want the audience to be engaged in and moved by the music from the opening crash of the piece to the fast ending scales. And between soloist, orchestra, and conductor — to extend the playwright analogy — I have incredible actors and a great director to make it happen. Bella: I am so excited to share this very personal and special work with the audiences of Kansas City. I hope they will see this great new concerto coming to life right in front of them. To secure your tickets to hear guest violinist Bella Hristova perform David Ludwig’s Violin Concerto (written expressly for her) with the Kansas City Symphony for the April 8-10 concerts in Helzberg Hall at the Kauffman Center for the Performing Arts, visit the ticket page here or call the Symphony Box Office between 10 a.m. and 5 p.m. Monday through Friday. Tickets start at $25. Also on the program is Ives’ Symphony No. 3, “The Camp Meeting,” Debussy’s Ibéria and Gershwin’s An American in Paris.